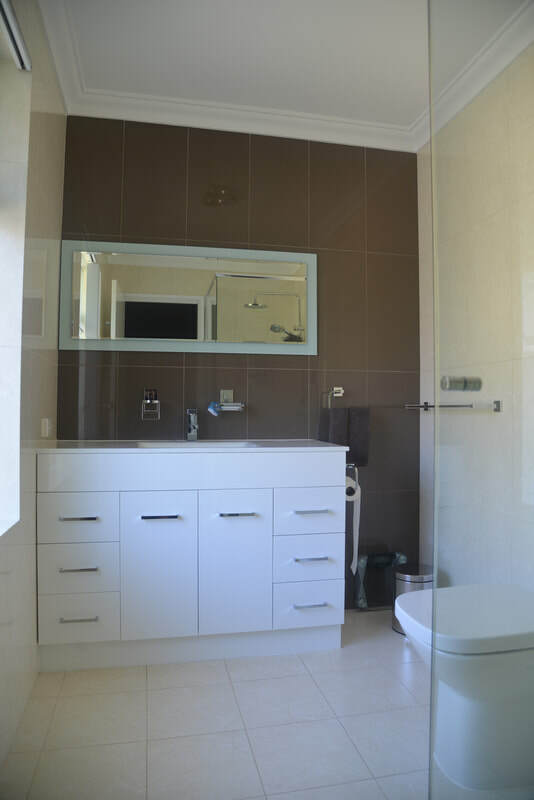 James and the team at Perth Property Improver have had over 16 years of experience in updating, remodeling and renovating bathrooms. We specialise in cost-effective bathroom renovations that add value, functionality and style to your home. We source and install cabinets from our trusted and quality assured local supplier, a custom made solution for that will fit in with your budget and requirements. All aspects of the renovation will be taken care of, we project manage your entire scope of work, from design to completion, working in conjunction with a licensed builder when required. Unlike most bathroom renovation companies, we are also happy to install flat pack cabinets from any supplier of your choosing. We will then design a bathroom that you will be proud of, that will add value to your home with quality materials that will ensure a lasting effect. Our main supplier, based in Osborne Park, has been in the cabinet making business for 30 years and their competitive pricing & quality is second to none. Install, replace or update bathroom vanities and basins. Replace or update bathroom vanity bench tops with laminate, composite stone, marble or granite. Install new vanity basins - sunken or raised styles. Update vanity door handles, install soft close doors and hinges. Install flat packed bathroom cabinets or custom cabinet manufacture. "There are a variety of bench tops & cabinetry, laminates, granite, marble & composite stones that I am able to source direct from the manufacturer & pass on the savings. Cabinet materials vary a lot, from the very cheap chipboard which has a large chip, low compression, poor quality glue & thin laminate which is prone to chipping. The end result is a waterlogged expanded panel due to being in a moist environment. Replace or update bathroom tiling - floor and wall. Tile matching, in some cases old tiles can be sourced to save re tiling the whole bathroom. Grout matching or re-grouting of tiling. Build or install all types of showers and shower recesses including step down shower recesses, pre fabricated shower bases and showers with hidden water waste. Install or replace Shower Screens - framed, semi-framed, frame-less or custom. designed shower screens. Install or replace a bath or spa bath. Raise or lower the bath position. Refinish your existing bath by painting it with epoxy bath paint. Install or repair waterproof membranes and waterproof backing. Undertake asbestos shower recess renovations. Install or replace bathroom fans​. Bathroom Taps - replace, relocate and update bathroom tap ware including flick mixer installation. Replace, move and install shower heads. Install towel rails, including heated towel rails. Bathroom window replacement and glazing services. Install or replace bathroom doors including door hanging and door trimming. Ceiling painting and cornice replacement. Colour consultant for bathroom design and product selection available. Our client wanted to upgrade & modernise the bathroom. Increase the bath size, incorporate hidden drains & a wall shower caddy. The shower hob was removed & the shower area stepped down. Two strips of feature tile was added to break up the walls, flick mixers in the bath, shower & vanity were added. With this bathroom we installed a spa bath & raised it, installed a hidden Bermuda floor waste, custom stone vanity & a shaving mirror for extra storage. This bathroom design was kept the same & everything was updated. Flick mixers, hidden floor wastes, new vanity, shower screen, new bath & tiles. There was a Roman spa bath installed with the shower above the spa. Our client wanted the spa out & a toughened glass, 10mm panel inserted. Floor tiles matched where required & the walls retiled with a sunken shower area. Below the vanities were replaced without the expense of retiling the entire bathroom. We were able to match the tiles & grout, replacing tiles where the old vanity bench top met the wall. The instillation of a 900mm wide shaving mirror solved the storage issue. The bathroom received a rejuvenation at a fraction of the cost of a full bathroom renovation. This bathroom had an old vanity top like the one above, extending over the bath. We were unable to match the tiles so rather than re tiling the whole room a small shelf was made & installed. Our client wanted to access the vanity with ease, so we custom designed this cabinet using draws, for the same price as an 'off the shelf' cabinet.